n 1817 the navigation of the Mississippi River was begun. 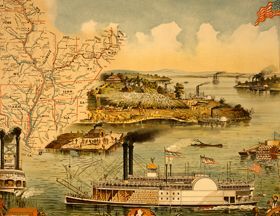 On August 2nd the steamer General Pike arrived at St. Louis, Missouri. The first boat to ascend the Missouri River was the Independence; she passed Franklin, Missouri on May 28, 1819, where a dinner was given to her officers. In the next month, the steamers Western Engineer Expedition and R. M. Johnson came along, carrying Major Stephen Long’s scientific exploring party, bound for the Yellowstone River. At that time, the quaint old cities of far-off Mexico were forbidden to foreign traders, excepting to the favored few who were successful in obtaining permits from the Spanish government. In 1821, however, the Mexican War of Independence crushed the power of the mother country and established the freedom of Mexico. The embargo upon foreign trade was at once removed, and the Santa Fe Trail, for untold ages only a simple trace across the continent, became the busy highway of a relatively great commerce. Santa Fe traders soon realized the benefits of river navigation — for it enabled them to shorten the distance which their wagons had to travel in going across the plains — and they began to look out for a suitable place as a shipping and outfitting point higher up the river than Franklin, Missouri which had been the initial starting town. By 1827 trading posts had been established at Blue Mills, Fort Osage, and Independence, Missouri. The first-mentioned place, which is situated about six miles below Independence, soon became the favorite landing, and the exchange from wagons to boats settled and defied all efforts to remove the headquarters of the trade from there for several years. 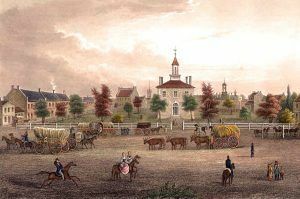 Independence, however, being the county seat and the larger place, succeeded in its claims to be the more suitable locality, and as early as 1832, it was recognized as the American headquarters and the great outfitting point for the Santa Fe commerce, which it continued to be until 1846, when the traffic was temporarily suspended by the breaking out of the Mexican-American War. Independence was not only the principal outfitting point for the Santa Fe Traders but also that of the great fur companies. That powerful association used to send out larger pack-trains than any other parties engaged in the traffic to the Rocky Mountains; they also employed wagons drawn by mules, and loaded with goods for the Indians with whom their agents bartered, which also on their return trip, transported the skins and pelts of animals procured from the Indians. The articles intended for the Indian trade were always purchased in St. Louis, Missouri and usually shipped to Independence, consigned to the firm of Aull and Company, who outfitted the traders with mules and provisions, and in fact, anything else required by them. Several individual traders would frequently form joint caravans, and travel in company for mutual protection from the Indians. After having reached a 50-mile limit from the State line, each trader had control of his own men; each took care of a certain number of the pack-animals, loaded and unloaded them in camp, and had general supervision of them. Frequently, there would be 300 mules in a single caravan, carrying 300 pounds apiece. 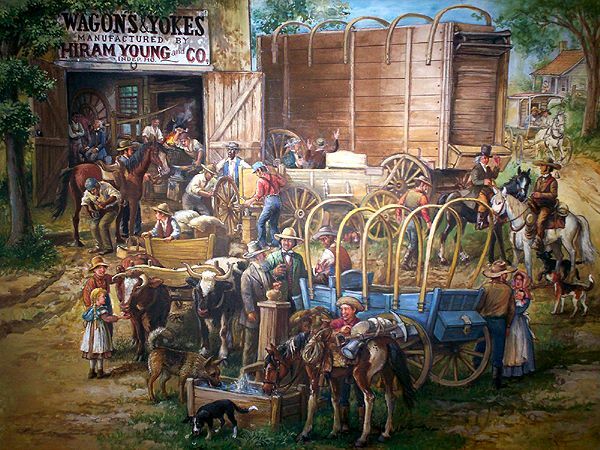 Thousands of wagons were also sent out from Independence annually, each drawn by twelve mules or six yoke of oxen, and loaded with general merchandise. There were no packing houses in those days nearer than St. Louis, and the bacon and beef used in the Santa Fe trade were furnished by the farmers of the surrounding country, who killed their meat, cured it, and transported it to the town where they sold it. Their wheat was also ground at local mills, and they brought the flour to market, together with corn, dried fruit, beans, peas, and kindred provisions used on the long route across the plains. 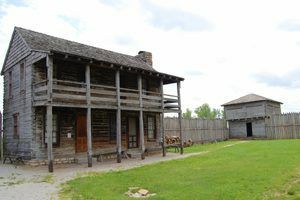 Independence very soon became the best market west of St. Louis for cattle, mules, and wagons; and as the acknowledged headquarters, furnished employment to several thousand men, including the teamsters and packers on the Santa Fe Trail. The wages paid varied from $25 to $50 a month and rations. The price charged for hauling freight to Santa Fe was $10 for every 100 pounds, each wagon earning from $500-$600 every trip, which was made in 80-90 days; some fast caravans making quicker time. The merchants and general traders of Independence in those days reaped a grand harvest. Everything to eat was in constant demand; mules and oxen were sold in great numbers every month at excellent prices and always for cash; while any good stockman could readily make from $10-$50 a day. One of the largest manufacturers and most enterprising young men in Independence at that time was Hiram Young, an African-American man. Besides making hundreds of wagons, he made all the ox-yokes used in the Santa Fe trade; fifty thousand annually during the 1850’s and until the breaking out of the Civil War. The forward yokes were sold at an average of $1.25 and the wheel yokes for $2.25. The freight transported by the wagons was always very securely loaded; each package had its contents plainly marked on the outside. The wagons were heavily covered and tightly closed. Every man belonging to the caravan was thoroughly armed, and ever on the alert to repulse an attack by the Indians. Sometimes at the crossing of the Arkansas River, the quicksands were so bad that it was necessary to get the caravan over in a hurry; then 40-50 yoke of oxen were hitched to one wagon and it was quickly yanked through the treacherous ford. This was not always the case, however; it depended upon the stage of water and recent floods. After the close of the Mexican-American War, the freight business across the plains increased dramatically. The possession of the country by the United States gave a fresh impetus to the New Mexico trade, and the traffic then began to be divided between Westport and Kansas City. Independence lost control of the overland commerce and Kansas City commenced its rapid growth. Then came the discovery of gold in California, and this gave an increased business westward; for thousands of men and their families crossed the plains and the Rocky Mountains, seeking their fortunes in the new El Dorado. The Old Trail was the highway of an enormous pilgrimage, and both Independence and Kansas City became the initial point of emigration.